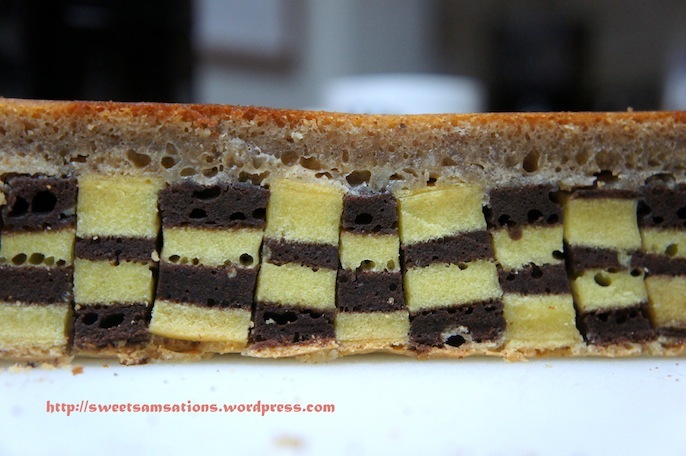 At age 22, I finally discovered the name of this cake while looking at Kue Lapis Sarawak cakes. It was known as “Lapis Legit Tikar” or “Lapis Legit Domino”. You could not imagine my excitement! I HAD TO BAKE IT!! So yes! I was NOT dreaming! There was such a cake! Now, it was looking for the recipe that was quite challenging… Unfortunately I wasn’t able to find any I was satisfied with. 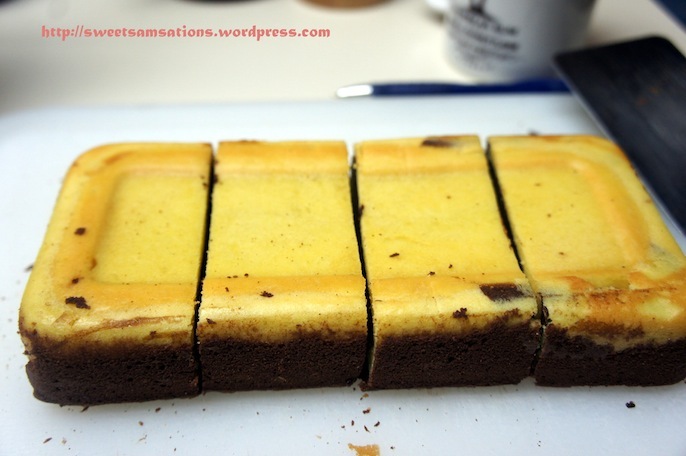 So I decided to combine half of the Kue Lapis recipe I used in my previous post with a Lapis Surabaya / Spiku recipe! I’ll have to admit that my checkered patterns weren’t done as well as I would have liked them! The pan I used was not completely flat. It had a little bump in the middle at the bottom. Huge mistake! I should have used a completely rectangular loaf pan instead. 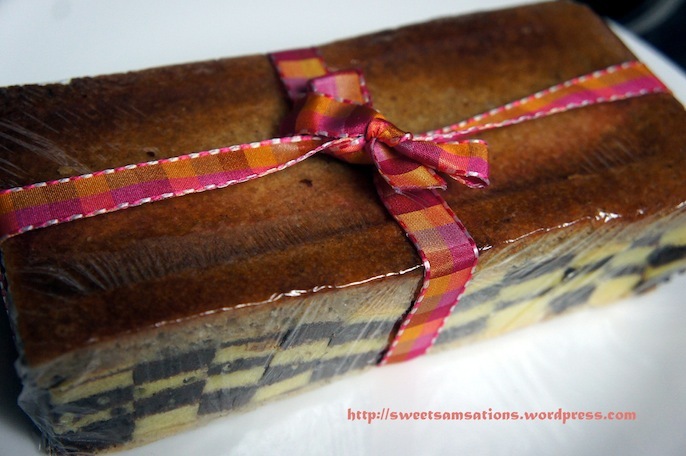 I am submitting this post to Aspiring Bakers #12: Traditional Kueh (October 2011) hosted by SSB of Small Small Baker. Recipe: Everything mixed from top to bottom or refer to links. 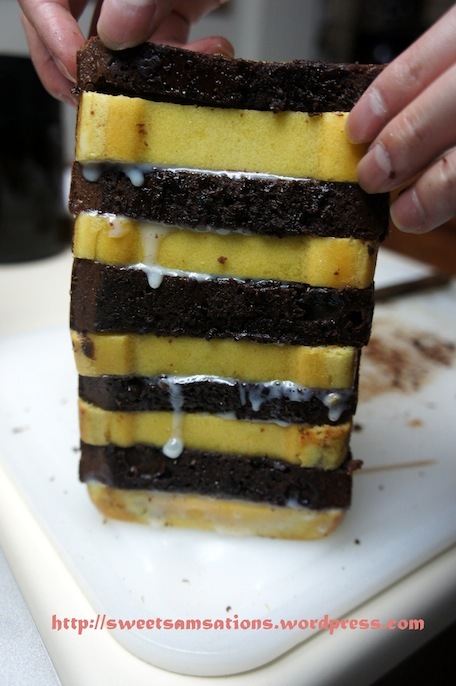 1) Start off with layering the chocolate and yellow layers. I divided both batter approximately in half and alternated the layers between both colours. 2) Remove the Spiku cake and divide into 12 pieces. I divided it into 4 first, and then divided each quarter into 3! If you want the checkered patterns more even, you could mark the top and bottom with a small slit to make sure you cut through evenly. As you can see, mine was a little crooked. Dividing the Spiku cake into 12. 3) Now, using the same pan, bake 3 layers of Lapis Legit. While doing so, invert every second piece of Spiku cake and apply condense milk to the sides of the Spiku cake, “gluing” them together. 4) When the 3rd layer of the Lapis Legit cake is completed, apply a layer of condense milk over it and place the checkered Spiku cake on top. Now finish off by layering the remaining of your Lapis Legit batter. Ta dah!!! Final result!!!! Ewww I can see ugly air bubbles inside. 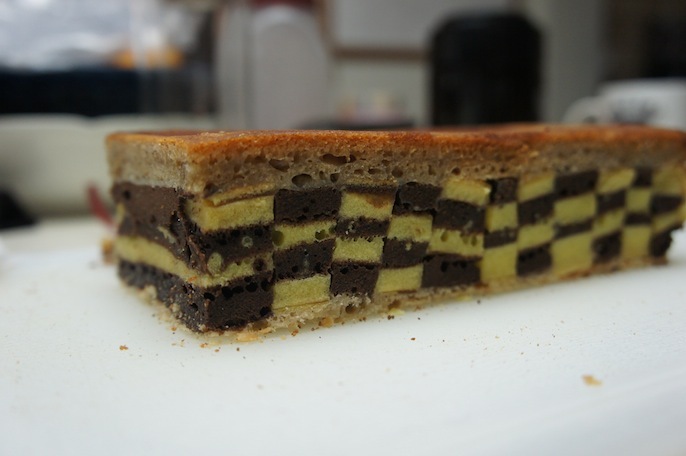 😦 Also note that the cake would only show its pretty checkered layers when cut in one direction! 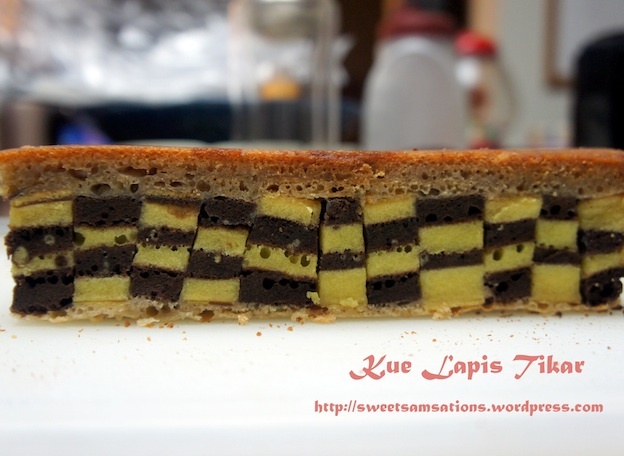 Perhaps it was the checkered pattern that brought a smile to my face when I was a little kid, or maybe it was due to my reduction of sugar on the Spiku recipe, but at this moment I would prefer the taste of the original Kue Lapis Legit! It was Brad’s mum’s birthday, and I thought I’d make this special pretty cake for her! Some day I’ll make the more delicious original for her too! Unfortunately, this time I was unable to bring out the beautiful layers in my Lapis Legit cake. I believe this may be attributed to the change in oven. I was using a newer convection oven instead of my old crappy oven! This oven was a lot stronger and cooked the batter before it was able to turn golden brown! I guess crappy old ovens are better for Lapis cakes! Another lesson I learned about Lapis Legit cakes was that they definitely taste better the next day and you need to store them in containers instead of merely wrapping them in Seran! 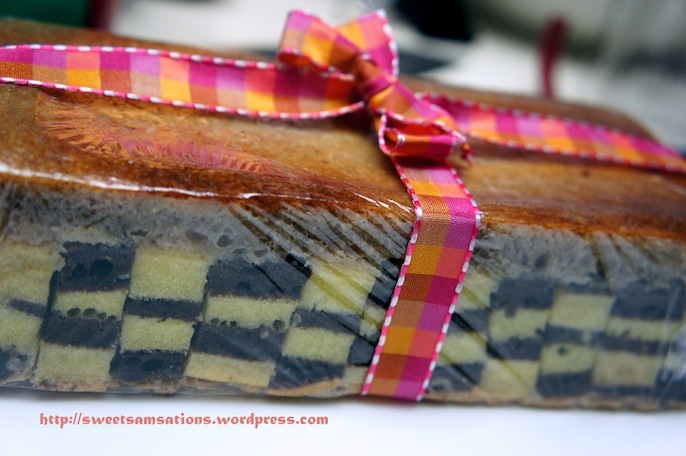 The cake turned really dry when I “gift wrapped” the Lapis Tikar in Seran. When Connie later stored it in a container, it became much softer and more moist. Especially in less humid countries like Canada, you can’t afford to leave the cake sitting in the kitchen with nothing more than Seran covering it. The first day this cake is baked is usually when it is at the peak of its driest! Some day I will attempt this laborious cake again! There’s just way too many things I know I “should have done” instead! Well, if you ever attempt it, I would love to see yours! Hey babe this looks like a lot of work, but yay you did it. It looks good. Wish I was brads mom. omg sammie! i’m no expert (not even an amateur actually) and i don’t know what it tastes like but definitely A++++ for effort!! i can’t imagine the amount of work that went into this. i’d be honored to have received it as a gift! how long did you take to get this done? awwww! You’re so sweet Natzie! This one took me like 4 or 5 hours! I had to stand by the oven to watch it bake and take it out almost every 5-10 minutes! hehe.. Yeah, it’s a rather uncommon cake!! Only had it once in my life! This was the second one. lol! One day when I have 5 hours to kill I might attempt it again….